The 2018 Chevy Silverado is a formidable beast. Originally bred in 1918, the past century of the Silverado has led the charge in half-ton ¾ ton and 1-ton pickups that are always ready to put in a solid day’s work. And while the trucks of olde only had work on their minds, the modern iterations proudly couple innovative technology, luxurious creature comforts and soft materials – helping to make the 2018 Silverado a true jack of all trades. In this post, we’re taking an in-depth look at the entire Silverado lineup for 2018. 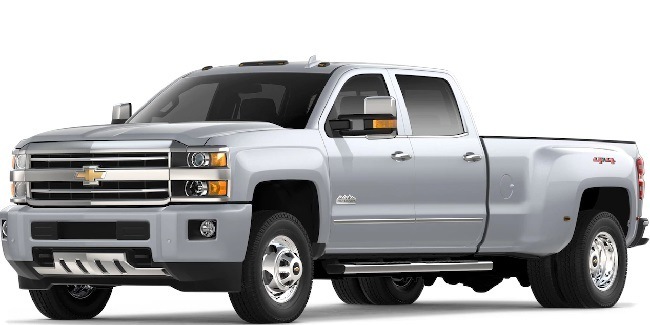 The standard Silverado 1500 is a staple of every job site, hockey game, and grocery store parking lot. It’s a workhorse with a heat of gold, and that’s led the Chevy to become one of the most popular pickups in North America. The 2018 1500 comes standard with many features that the competition can only offer as upgrades, helping accommodate the wish lists of consumers everywhere without tearing a hole in their wallets. With features like HID headlamps with LED signature lighting, CornerStep rear bumpers, DuraLife brake rotors, 4G LTE Wi-Fi, rear-view backup camera, and an 8-inch touchscreen infotainment system – all standard – the Chev is miles ahead of the competition. Powered by three unique power plants with an optimum balance of raw power and fuel efficiency in mind helps validate the strong reputation of the Silverado. The legendary EcoTec3 lineup of small block motors offer Active Fuel Management, Direct Injection and Continuously Variable Valve Timing and an 8-speed transmission as standard on both the High Country and Crew Cab LTZ Z71 editions. The 6.t2L EcoTec3 V8 produces a colossal 420 horsepower and 460 ft/lb of torque for a best-in-class towing capacity of 12,500 pounds. The more compact 5.3L V8 is capable of towing 11,100 pounds and boasts a fuel efficiency rating of 10.3L/100km while the 4.3L EcoTec3 V6 develops a best-in-class 305 ft/lb of torque, allowing the tiny motor to tow upwards of 7,500 pounds. 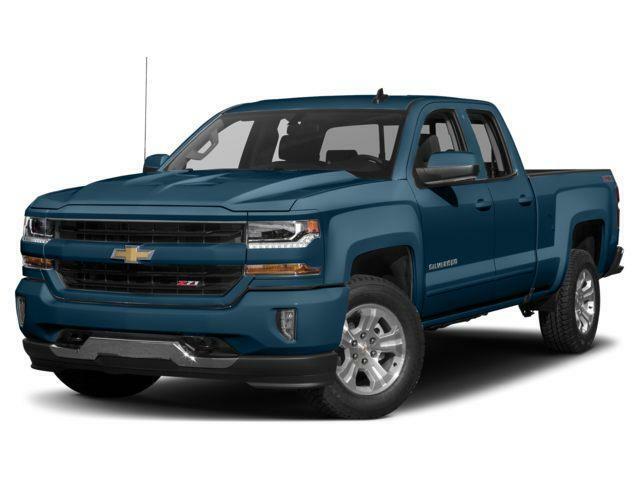 For those who like a unique truck that stands out in a crowd, there’s a serious lineup of available SIlverado special editions ready to ignite your love of the open road and anything it throws your way. Offering mega off-road capability thanks to off-road tuned suspension, all-terrain tires, Rancho mono-tube shocks, skid plates, hill descent control and an Eaton automatic locking rear diff that’s not offered by any other competitor. Sporting red and black accents for a unique look that’s inspired by urban design. Available on LT Z71 double cabs and LTZ Z71 crew cabs, the REdline edition features 20-inch black rims with red accents and black headlamp trim amongst a plethora of other colour-coded visual cues. Marking 100 years of Chevy heritage, the Centennial edition boasts unique heritage bowties, badging and Z71 off-road capability. 22-inch aluminum rims, all-weather mats, and a spray-on bedliner with heritage inspired bowtie emblem all paired with a beautiful blue metallic exterior colour. Inspired by the sporty, urbanized commute, the Rally editions sport rally-inspired striping on the hood and doors, 20 and 22-inch black aluminum wheels, spray-on bedliners, and blacked out Chevy bowtie emblems. A blacked out Silverado with off-road capability on its min, the Midnight edition is entirely black, sporting Goodyear Wrangler DuraTrac off-road tires, bigger emblems and badging, black skid plates, and 18-inch black aluminum rims. The ultimate pickup for the outdoor enthusiast. RealTree edition sports a black exterior that brandishes the matte black RealTree graphics – coupled with 20 inch aluminum black rims, all-terrain tires, black leather appointed interior, embroidered headrests, Rancho shocks and all-terrain tires. The rebellious Black Out features 20-inch black painted wheels, black emblems and front grille, and deep-tinted windows to take stealth mode into the next level. Complete with Naval inspired graphics with black accents and sporty accessories, the Special Ops edition brings deep tint windows, black sport assist steps, bed-mounted sidebars, all-terrain tires, and 20-inch black aluminum rims. One of our personal favourites, the High Desert package features sport bar sail panels, an all-new flexible locking storage system, lighted side storage boxes, a standard hard-folding tonneau cover, and magnetic ride control suspension (included on the High Country model). The Worksite standard when the going gets tough, the Chevy Silverado 2500HD comes ready to work with a bag full of impressive tricks. Let’s crunch some numbers, shall we? The 2500HD come standard with the Vortec 6.0L V8, capable of building serious amounts of torque at low RPM’s for a flatter, more accessible torque curve. Reaching 360 horsepower and 380 lb/ft of torque, the 6.0L is capable of towing up to 14,800 pounds, making it a king of power, performance, and efficiency. Not enough for you? 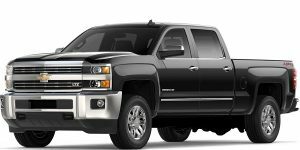 The available 6.6L Turbo-Diesel Duramax V8 engine produces 445 horsepower and an epic 910 ft/lb or twisting torque – a 19% increase from the previous model – giving drivers the confidence to tow just about anything. A functional Ram-air hood scoop help deliver more cold air to the engine to improve power and cooling prowess. All this magnificent power, but expect a quieter, reduced noise cabin thanks to acoustic rocker covers, isolated injectors, and a full-length acoustic lower oil pan connected to an all-new fuel system. Coupled into all 2500HD models for 2018 is an innovative and advanced trailering technology that helps deliver maximum stability and control on the road. The 2500 HD is also equipped with Digital Steering Assist with electronic controls that make trailering and towing easier and more stable. The undisputed king of towing, hauling, and payload, the 2500HD is a 6-wheeled beast of monumental proportions. Boasting the power of a 6.6L turbo-diesel Duramax V8 and an Allison Transmission, makers of military tank, medium-duty and heavy-duty commercial truck transmissions. The 3500HD can generate 910 ft/lb of torque and tow up to 23,300 pounds – enough grunt to literally pull your house off its foundation. It can also accommodate a maximum payload of 7,153 pounds, thanks in part to fully boxed frame rails made of high-strength rolled steel and nine cross members for lateral support. Lastly, the patent-pending and segment-exclusive Induction system in the Duramax uses two air inlets through the hood scoop and front fender to channel air to the engine, improving performance and efficiency to ensure that water and road debris are a non-issue, even in the most extreme conditions. When you don’t forget where you’ve come from, it’s easy to maintain a steady course of progression. The 2018 Chevy Silverado lineup is no exception. Heavy duty work and family balance needs a heavy duty line of trucks that can provide and maintain a consistent move forward with comfort, grit, efficiency, and accessibility in mind.